My family and I love Sunday brunch. We laugh, tell stories, and catch up on the previous week. 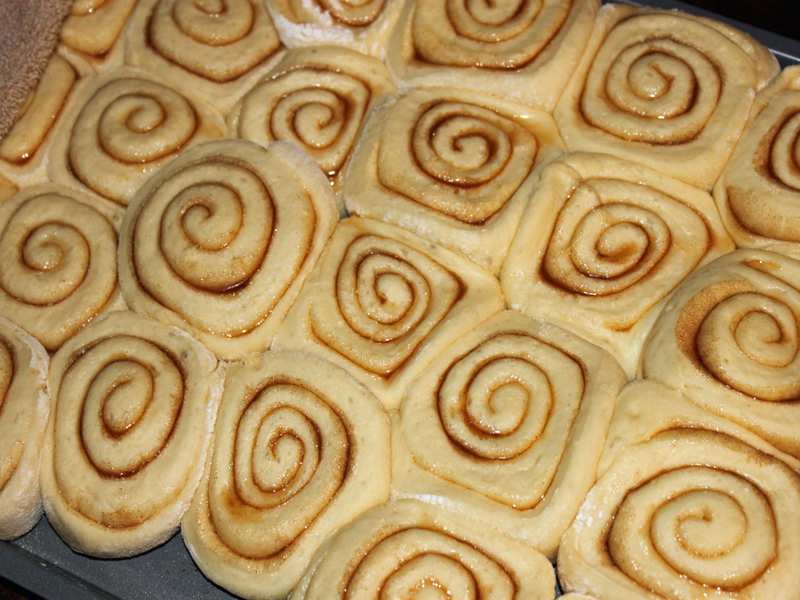 If it were up to my son, every single Sunday we would have cinnamon rolls on the brunch menu -- they are his absolute favorite. That gave me the idea to put a fun twist on his favorite brunch staple by making cinnamon roll waffles. While I have seen them done before with store bought cinnamon rolls, I could never buy those since they are pre-packaged and full of artificial flavors and colors. Instead, I took my favorite vegan waffle recipe and set out to make a batch of cinnamon roll waffles. The results were as amazing as you would expect -- and the best part is, they are piping hot and taste fantastic fresh from the waffle iron. Not to mention, they are a fun new way to serve an old favorite! Using your stand mixer, combine the sugar, Earth Balance, and salt together on medium speed with your paddle attachment. Then, add in the egg and lemon zest – followed by the yeast, flour, and milk. Mix all of the ingredients together on low until the dough forms a ball. Switch to your dough hook attachment and mix the dough for about 10 minutes on medium speed. You want the dough ball to be tacky but not sticky. If you need to add a little more water or flour to get the right consistency, that is alright. 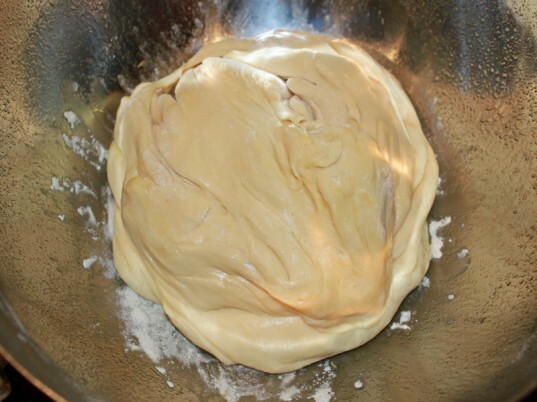 Remove the dough ball and place it in a lightly greased bowl to rise. Cover it with a cloth and let it rise for a couple of hours or until it doubles in size. 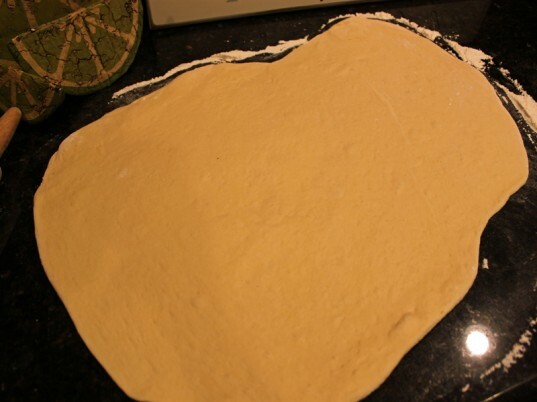 On a lightly floured counter top, roll out your dough into a large rectangle that is about 2/3 inches thick. Sprinkle the cinnamon sugar mixture over all of the dough and roll it into the shape of a log. Slice the log into 1 inch thick pieces and sit them on a baking sheet until they double in size, as shown in the lead image of this post. Heat up your waffle iron and place a cinnamon roll in each of the waffle slots – cook until done – remove from the waffle iron and top with a glaze of powdered sugar icing. 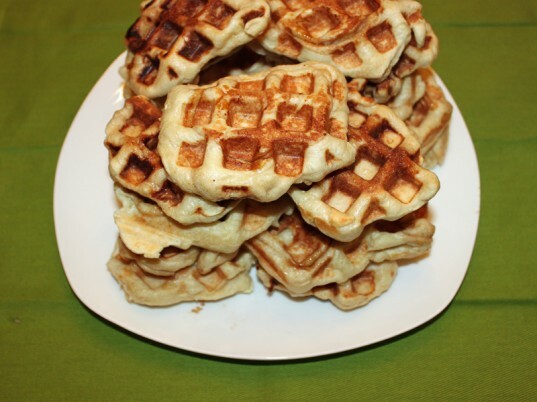 Surprise your family with vegan cinnamon roll waffles for breakfast! Using your stand mixer, combine the sugar, Earth Balance, and salt together on medium speed with your paddle attachment. 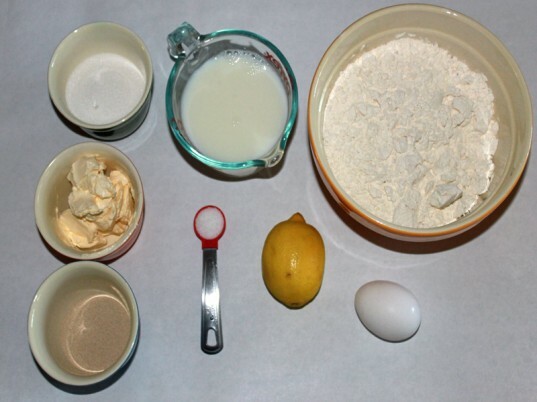 Then, add in the egg and lemon zest – followed by the yeast, flour, and milk. Mix all of the ingredients together on low until the dough forms a ball. Switch to your dough hook attachment and mix the dough for about 10 minutes on medium speed. You want the dough ball to be tacky but not sticky. If you need to add a little more water or flour to get the right consistency, that is alright. Remove the dough ball and place it in a lightly greased bowl to rise. Cover it with a cloth and let it rise for a couple of hours or until it doubles in size. On a lightly floured counter top roll out your dough into a large rectangle that is about 2/3 inches thick. Sprinkle the cinnamon sugar mixture over all of the dough and roll it into the shape of a log. Slice the log into the 1 inch thick pieces and sit them on a baking sheet until they double in size. Heat up your waffle iron and place a cinnamon roll in each of the waffle slots – cook until done – remove from the waffle iron and top with a glaze of powdered sugar icing. Surprise your family with vegan cinnamon roll waffles for breakfast! Using your stand mixer, combine the sugar, Earth Balance, and salt together on medium speed with your paddle attachment. Then, add in the egg and lemon zest - followed by the yeast, flour, and milk. Mix all of the ingredients together on low until the dough forms a ball. Switch to your dough hook attachment and mix the dough for about 10 minutes on medium speed. You want the dough ball to be tacky but not sticky. If you need to add a little more water or flour to get the right consistency, that is alright. 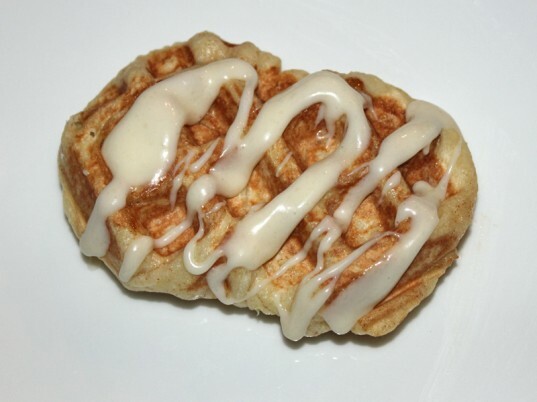 Heat up your waffle iron and place a cinnamon roll in each of the waffle slots - cook until done - remove from the waffle iron and top with a glaze of powdered sugar icing. Ingredients: 3 1/2 cups organic whole wheat flour 1/2 cup cinnamon sugar 1 1/4 cup organic soy milk vegan egg replacer for 1 egg or 1 organic egg 6 1/2 tbsp organic sugar 5 1/2 tbsp vegan Earth Balance butter spread 2 tbsp organic instant yeast 1 tsp salt lemon zest waffle iron Using your stand mixer, combine the sugar, Earth Balance, and salt together on medium speed with your paddle attachment. Then, add in the egg and lemon zest - followed by the yeast, flour, and milk. Mix all of the ingredients together on low until the dough forms a ball. Switch to your dough hook attachment and mix the dough for about 10 minutes on medium speed. You want the dough ball to be tacky but not sticky. If you need to add a little more water or flour to get the right consistency, that is alright. 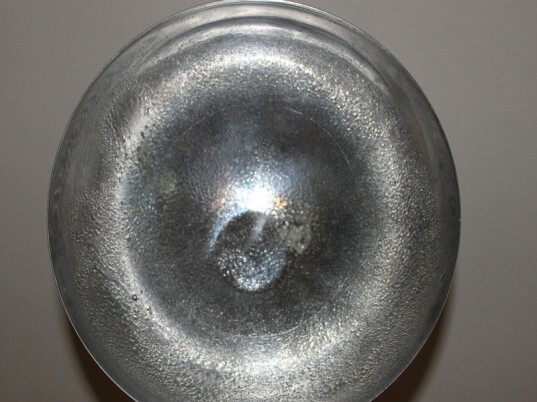 Remove the dough ball and place it in a lightly greased bowl to rise. Cover it with a cloth and let it rise for a couple of hours or until it doubles in size. On a lightly floured counter top roll out your dough into a large rectangle that is about 2/3 inches thick. Sprinkle the cinnamon sugar mixture all of the dough and roll it into the shape of a log. Slice the log into the 1 inch thick pieces and sit them on a baking sheet until they double in size. 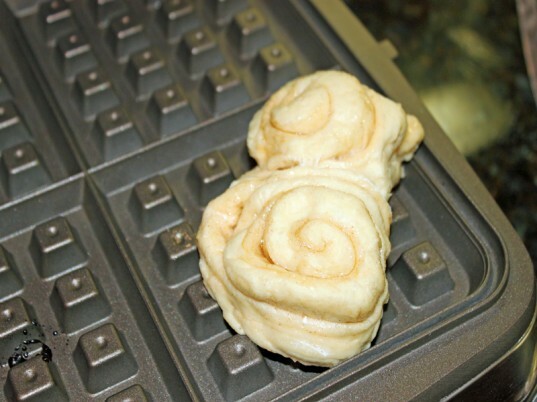 Heat up your waffle iron and place a cinnamon roll in each of the waffle slots - cook until done - remove from the waffle iron and top with a glaze of powdered sugar icing. Surprise your family with vegan cinnamon roll waffles for breakfast!